Travel down South Tacoma Way, in Tacoma, Washington, and the last thing you would expect to find is a bustling Arts & Crafts Press. But find, you do! Nestled between warehouses and industrial buildings is the castle like building with a bright red door that beckons you to open it up and discover the wonder inside. 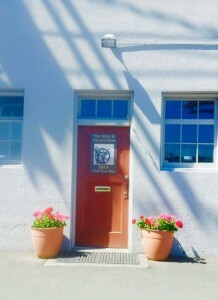 This wonderful building is home to the Arts & Crafts Press, founded by Yoshiko Yamamoto and Bruce Smith in 1996. The building, originally built for the Tillicum Toy Company in 1929 on Route 99, was once the largest wooden toy manufacturer in the Pacific Northwest. The original 1920’s castle like structure is the perfect setting for this press. 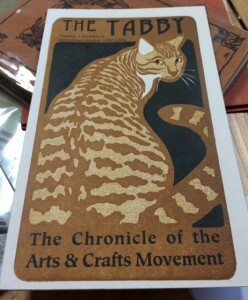 This small publication exemplifies the principals of the Arts & Crafts movement and resonates with the mission of the press. To paraphrase Bruce, “the work and craft we do is as important at the art we do.” Both Bruce and Yoshiko draw inspiration from the work of William Morris, but also from Elbert Hubbard and the Roycrofters, Dard Hunter, Will Bradley and Frederic Goudy. 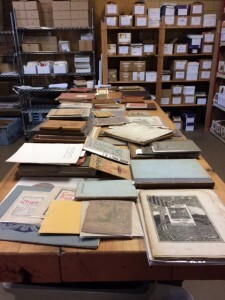 Their personal collection of Arts & Crafts publications and ephemera, including a printer’s scrapbook, serve as a foundation for much of their work. A small part of Bruce Smiths collection of work from the Arts & Crafts Movement. Clearly, Bruce Smith, as a long time author and collector in the fields of both William Morris and Arts & Crafts printing history has a deep love, understanding and admiration for the influence of Morris. 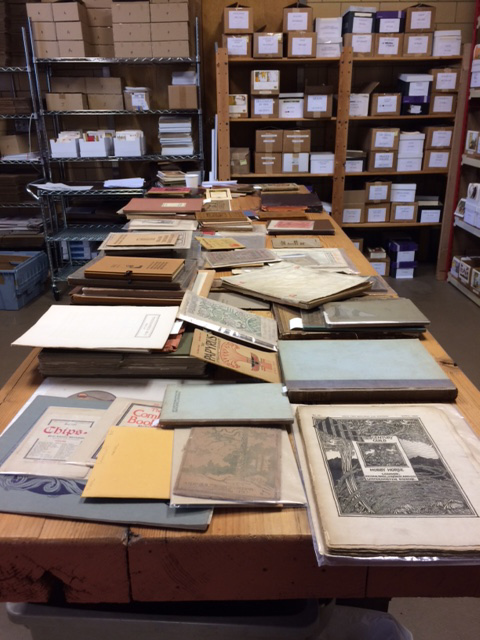 The many examples he showed the group of books printed shortly after Morris’s death, as well as those printed well into the early 20th century, helped us all understand how their own The Arts & Crafts Press came into existence. 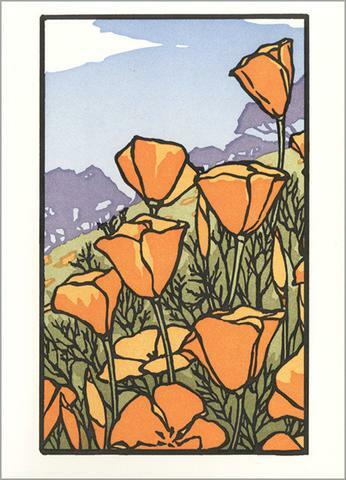 Yoshiko Yamamoto, the artist/printer has clearly learned a great deal from the study of the works of Morris, Dard Hunter and others of the Arts & Crafts movement. 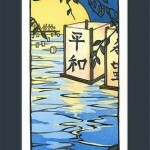 But her early life in Japan, her study of their wonderful wood block art form have resulted in her own true unique style. Her colors are bold and bright and totally pleasing to the eye. 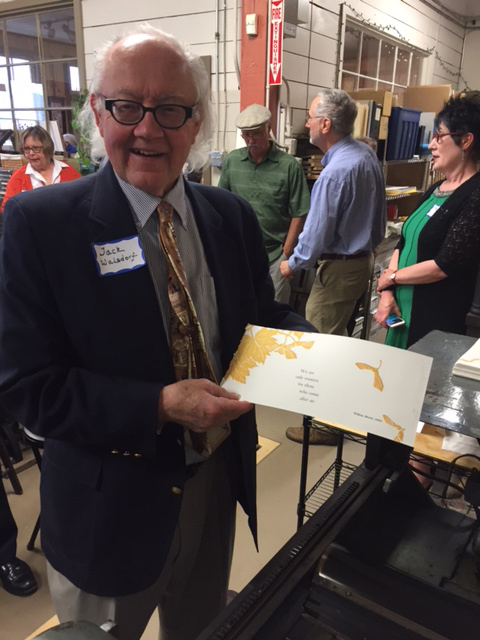 Her printing, be it on note cards, pictures or broadsides are always of the highest quality. Both Bruce and Yoshiko are also committed to social justice and sustainability. 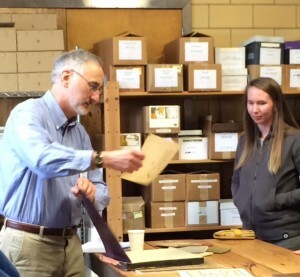 The Press seeks to embrace environmentally sustainable materials and ways of printing. Recycling all their paper and metal and using many soy based inks and vegetable oil for cleaning are just some of the ways they care for our environment. 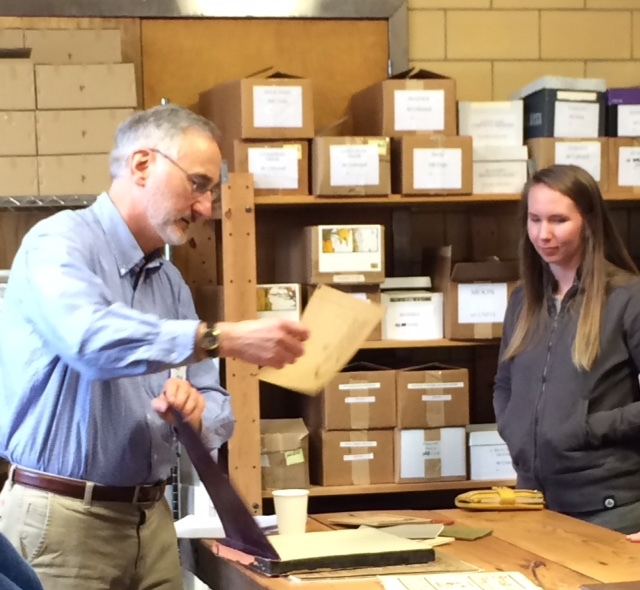 The Press serves as a model for responsible printing and as shared from their web site: We print, because we care and love our friends, family, and environs. So why not take it one step further and print kinder to ourselves and our earth? Recently, Bruce and Yoshiko participated in the annual From Hiroshima to Hope: Lantern Ceremony in Seattle. An annual event to promote peace event in memory of victims of Hiroshima/Nagasaki and all victims of violence and war. 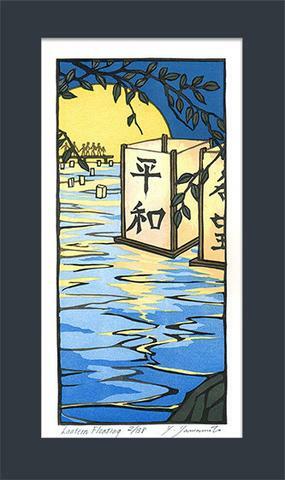 The block print Lantern Floating commemorates this event. Yoshiko Yamamoto designed, carved and printed this linoleum block print with the help of another Tacoma based artist Taylor Cox. One of the true highlights of visiting The Arts and Crafts Press was being able to print a keepsake, designed by Yoshiko , using the Morris quotation; “We are only Trustees for those who come after us. William Morris (1889). This keepsake holds special meaning as Yoshiko has just returned from a visit to the UK where she visited many of the Morris landmarks; including Kelmscott Manor. She is working on a new project to illustrate News from Nowhere, which will no doubt be a most impressive artistic endeavor. 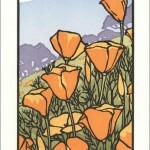 Yoshiko and Bruce inspire a new generation of printers, artists, and lovers of Morris and the Arts & Crafts movement. They work hard to maintain work that is affordable and accessible to all but of the highest quality. Mark Hoppmann, a well-known Tacoma artist, and President of the Puget Sound Book Artists has this to say about their work: Thoreau once said “Most men lead lives of quiet desperation and go to the grave with the song still in them.” Not so, with Yoshiko Yamamoto and Bruce Smith. 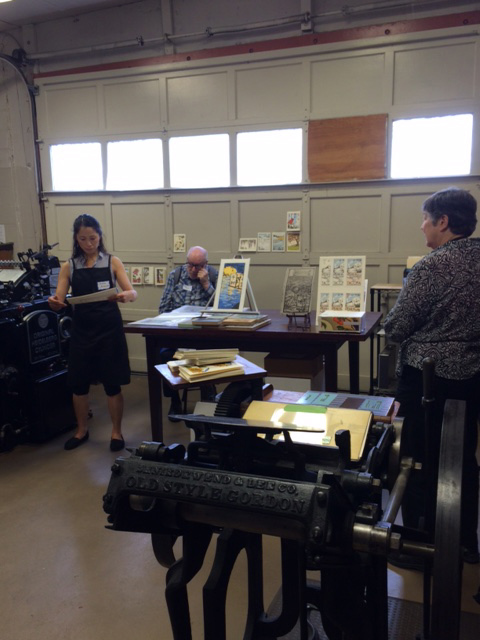 Surrounded by both vintage and modern letterpress equipment, both Bruce and Yoshiko are leaving a legacy in their own right, to the arts and crafts movement begun in the late 19th century. It will be through the writing and collecting efforts of people like Bruce Smith and the art and printing of Yoshiko Yamamoto, that collectors and lovers of fine books and prints will be able to afford what William Morris wanted throughout his life, art for the people. For additional information about this fine press, be sure to visit the Arts & Crafts website! This entry was posted in Archived Events, Lectures & Presentations, Member News. Bookmark the permalink.